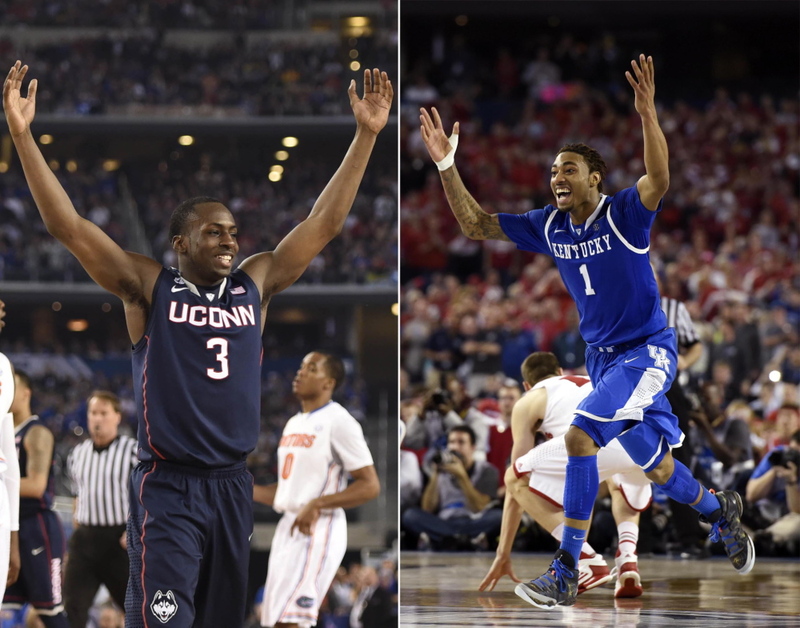 After missing the tournament last season, the Huskies and Wildcats upset their way to the title game. ARLINGTON, Texas – Connecticut and Kentucky couldn’t have met in last year’s championship game and few people gave them a chance to be in this year’s. Neither was around in last year’s postseason – Connecticut because of a tournament ban over academic issues; Kentucky because it didn’t make the field. And neither looked like national title contenders at times this season. Kentucky (29-10) and its outstanding freshmen went from preseason No. 1 to out of the rankings after some bad losses. And Connecticut (31-8) was not a popular postseason pick after finishing tied for third in the American Athletic Conference with multiple losses to Louisville and SMU. In the tournament, the Huskies have stopped some of the country’s top guards and put themselves in position for their fourth national championship, the previous three under Naismith Memorial Hall of Fame coach Jim Calhoun. If Kentucky has a chance to win in the final minute, that defense better pay attention to guard Aaron Harrison, one of five freshmen starters. He has hit huge 3-pointers in the Wildcats’ last three games. Harrison rattled in a 26-footer with 5.7 seconds to go in the 74-73 win over Wisconsin in the semifinals. He made almost the exact same shot with 2.3 seconds left against Michigan for a 75-72 win that sent the Wildcats to the Final Four. Against Louisville, he hit a 3 with 39 seconds left to give Kentucky the lead for good in a 74-69. These two programs have combined to win six of the last 18 NCAA titles. “Playing against Connecticut, I mean, I’m just happy we’re still playing,” Calipari said. Neither program could say that last year. Connecticut was banned from the postseason after failing to meet NCAA academic standard. It had practice limitations and lost a scholarship. The players could have transferred but didn’t. The Huskies finished 20-10 in Ollie’s first year. They took the hit and made it back to the biggest stage. The leader of the group is All-American Shabazz Napier who leads the team in almost every statistical category. He’s the guy who makes the big shot or big pass. Fellow guard Ryan Boatright has taken some of the spotlight recently for his defensive performances against the likes of Keith Appling of Michigan State and Scottie Wilbekin of Florida. Kentucky is playing its best basketball lately, led by big man Julius Randle and the Harrison twins. This is Calipari’s fourth Final Four, but the first two – Massachusetts in 1996 and Memphis in 2008 – were vacated over NCAA rules violations. Now the Wildcats are on an 11-game winning streak in the NCAA tournament and they are one win from a ninth national championship for Kentucky.